Taking electrical energy to where it's needed traditionally involves expensive infrastructure that works well in cities but becomes prohibitively expensive when consumers are few and far between such as the rural areas where much of the world's population resides. Enter Power-Blox and its novel approach to "˜swarm' power that makes bringing energy to remote locals a lot like stacking LEGOs. Power-Blox is the company co-founded by Alessandro Medici, CEO, and Armand Martin, board chairman, two Swiss engineers with a passion for bringing power to millions who lack convenient and affordable access to energy. The Power-Blox concept and products have garnered a number of awards including recognition in 2017 with a Solar + Power Award for rural electrification from Solar+Power magazine. Medici explained in an interview with editor Mark Andrews that his experience with rural electrification changed his life when a friend with a ranch in rural Kenya called "˜Segera' asked for Medici's help to modernize and electrify the facility in the heart of Laikipia, near a village called Nanyuki. "It was complicated," Medici said recently. "And I was impressed by the fact that it took someone with my education and experience to configure and plan a power system that met the ranch's needs, and that as those needs changed much of the system would need to be upgraded or changed, so even good things like more business would also mean greater expenses and time to do all this. If you have not built a power system in the middle of "˜nowhere' the challenges cannot be fully appreciated. " Medici said he discovered that the problem with most contemporary power systems (including most renewable energy plants) is that each is built from scratch, or requires a basic plan that is modified to fit particular needs"”in essence, everything is "˜custom' to a certain degree. As needs change, so must the power plan change along with its actual, physical components that provide the energy. While the Power-Blox inventers appreciated that they needed a modular design with batteries for portability, the basic concept of systems before Power-Blox all utilized batteries in a similar fashion. Those systems are centralized, with a "˜master' control unit that builds the voltage and maintains proper frequency across the entire structure. If the controller fails, the entire system goes down. If the system needs to be upgraded to supply more power, it needs more than additional batteries, the control hardware and software must also be upgraded. All of this typically requires specialized, skilled technicians that are in short supply in most rural areas across the globe. Enter Power-Blox. The Power-Blox approach is different, said Medici, in that it is based on ideas from nature that can instinctively control swarm behavior in fish, birds, insects and other large groups. In a swarm there is no central controller that "˜tells' members of the group how to behave in order to travel together, fend off predators or accomplish other goals. A swarm governs activity by having each member maintain its location, distance and speed relative to other members; if one member falls out the overall structure is maintained. Members can come and go as needed, just as Power-Blox units can be added or subtracted to deliver the power that a community or an individual needs. The company's unique "˜secret sauce' is found in the algorithms that specify behavior for members of the Power-Blox swarm (battery units in this case) that are added or subtracted. Swarm technology is what makes Power-Blox different from any other battery system. At its simplest, a single Power-Blox 200 series cube and solar panel can function as an off-grid power supply. In this example the unit's 1.2 kWh battery and 230V AC / 200W inverter can provide enough electricity for a small refrigerator, a mobile phone charger, and up to three 7W LED lamps. A larger system with greater capacity can be created by adding multiple Power-Blox units by simply stacking them like LEGO blocks to create towers or walls of power with the units connected in parallel. Power-Blox modularity is what allows users to quickly scale up a system to provide more power or more backup capacity, with "˜no engineering, no calculations, no manual' required. Individual Power-Blox cubes can be stacked together to provide a centralized power system if that is what is needed for security or other purposes, or the grid can be easily distributed out into the service area using what Medici called a "˜snowflake topology' that places cubes at various locations that can be connected with industry standard 16mm cables. "The system is intuitive, meaning that one does not need to be an engineer like me to figure it out," remarked Medici. "Once you explain how the system works to new Power-Blox owners, anyone can reconfigure their system as needed. " Power-Blox was originally conceived as an off-grid electricity supply, which is already seeing use in Kenya, Tanzania and other locations, said Medici. The system can be used to create a solar-powered micro-grid to power a village, a hospital or clinic, or to support disaster relief efforts by using either the centralized or decentralized (snowflake) approach. Power-Blox can also be put into place as a backup power system in locations where the public grid is unreliable, unstable or where a constant and stable supply of electricity is crucial. Power-Blox units already available are offered with either lead acid or Lithium-ion batteries, outputting energy at 230 V/50 Hertz. The company plans to offer versions at 110 V and 60 Hertz, the electrical standard employed in North America and elsewhere. Choice of battery chemistry will be maintained so purchasers can select the battery type that fits their transportation plans. Versions of Power-Blox for various regions of the world are in development and Medici expects availability later in 2018. The company is also examining a simple means for consumers to use Power-Blox in racked micro-grid designs that would enable independent power systems for household or commercial needs in Europe, the Americas and elsewhere, supporting the creation of user-friendly power systems that could be expanded easily as power needs change over time. "Power-Blox strength is its easiness, flexibility and scalability. Depending on the country regulation, you could think of a future in which you could buy a Power-Blox in the shop around the corner and just take it home and plug it into a standard wall socket. It will store energy during day when your own solar field on the roof is producing too much power and feed it back during the night. " "If you need more storage capacity, just buy another one and stack it. You don't need any engineering or specialists to extend your system. This way you can start small and extend your system over time,"Medici explained. 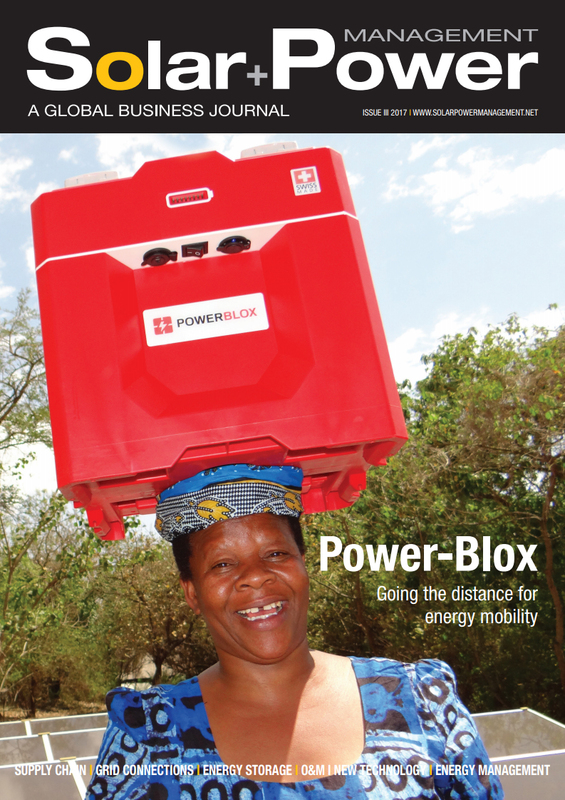 Power-Blox has been honored with recognition from international organizations including a 2017 Solar + Power Award in the rural electrification category; a United Nations National Energy Globe Award of Tanzania in 2015, and an Axpo Energy Award in 2014.